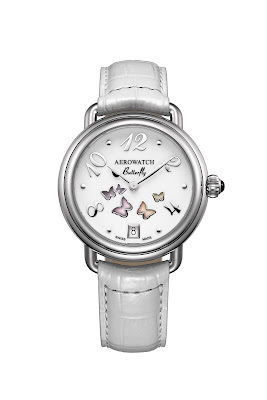 The subtle flutter of butterflies which grace our summers inspired Aerowatch to launch a new creation for ladies, a timepiece that endearingly symbolizes the sensuous lightness of being. It is a watch that gently hugs the wrist and reflects the free spirit of dainty butterflies as they frolic in the summer breeze, evoking and recalling moments of joy and fulfillment. A round steel case emphasizes the finesse of the dial: decorated with delicate wings and voluptuous Arabic numerals, its poetry invites contemplation. The vivacious Butterfly features a Swiss quartz movement with an aperture date and is worn on a noble white leather strap. This lovely watch pays tribute to all the women in the world and is eager to brighten their days with bliss and happiness. The Butterfly is available exclusively from Aerowatch dealers.